Our 2019 Summer Camp Schedule is now available. Check out our popular Golf Camp (Fox Creek Golf Club)! Register early to reserve your spot! Montessori education took root over 90 years ago with Dr. Maria Montessori, Italy’s first female physician, at the helm. Dr. Montessori observed that children learned as easily as breathing when the learning environment provided was rich and orderly. She also recognized that children learned by doing. Dr. Montessori, like most educators and psychologists today, believed that the most important period in the development of the mind occurs between birth and age five. 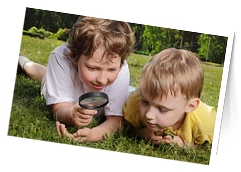 A child’s mind is extremely absorbent and their curiosity is at a peak during the early years. One fundamental belief of Montessori education is that children learn at their own pace and according to their individual skills and personalities. “I think the opportunity to learn at your own pace and your own motivational level will — would allow anyone to achieve more than they would otherwise.” —Jan Davidson, Davidson Institute for Talent Development. 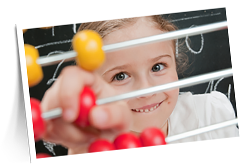 With its depth of experience from educating children in the Montessori Method, Montessori Dieppe delivers an authentic Montessori experience by adhering to genuine Montessori instruction methods and classroom set-up. What is an Authentic Montessori Environment? The Montessori Learning Environment: The furniture in the classroom is the right size for the students. The learning materials match the development capabilities, interests, and needs of the children. The materials allow for multiple modalities of learning and discovery, offering a wide range of intellectual challenges. Learning activities in the Montessori environment involve inquiry, discovery, multiple perspectives, and differing viewpoints providing continuous feedback on progress. The focus is on children’s learning, not on teachers’ teaching. Generally, students work individually or in small, self-selected groups. There will be very few whole group lessons. A Responsive Prepared Environment: The environment should be designed to meet the needs, interests, abilities, and development of the children. The teachers should design and adapt the environment with this community of children in mind, rapidly modifying the selection of educational materials available, the physical layout, and the tone of the class to best fit the ever-changing needs of the children. A Focus on Individual Progress and Development: Within a Montessori program, children progress at their own pace, moving on to the next step in each area of learning as they are ready. While the child works within a larger community of children, each student is viewed as a universe of one. Hands-on Learning: In Montessori, students rarely learn from texts or workbooks. In all cases, direct personal hands-on contact with either real things under study or with concrete models that bring abstract concepts to life allow children to learn with much deeper understanding. Self-directed Activity: One of Montessori’s key concepts is the idea that children are driven by their desire to become independent and competent beings in the world to learn new things and master new skills. For this reason, outside rewards to create external motivation are both unnecessary and potentially can lead to passive adults who are dependent on others for everything from their self-image to permission to follow their dreams. In the process of making independent choices and exploring concepts largely on their own, Montessori children construct their own sense of individual identity and of right and wrong. Mixed age groups: Montessori classrooms gather together children of two, three, or more age levels into a family group. Children remain together for several years. A Family Setting: Montessori classrooms are communities of children and adults. As children grow older and more capable, they assume a great role in helping to care for the environment and meet the needs of younger children in the class. The focus is less on the teachers, and more on the entire community of children and adults, much like one finds in a real family. Cooperation and Collaboration, Rather Than Competition: Montessori children are encouraged to treat one another with kindness and respect. Insults and shunning behavior tends to be much more rare. Instead we normally find children who have a great fondness for one another. Because children learn at their own pace, teachers refrain from comparing students against one another. The Child as a Spiritual Being: Maria Montessori saw children as far more than simply scholars. In her view, each child is a full and complete human being, the mother or father of the adult man or woman she will become. Even when very young, the child shares with the rest of humanity hopes, dreams, and fears, emotions, and longing. From her perspective, this goes beyond mental health to the very core of one’s inner spiritual life. Montessori consciously designs social communities and educational experiences that cultivate the child’s sense of independence, self-respect, love of peace, passion for self-chosen work done well, and ability to respect and celebrate the individual spirit within people of all ages and the value of all life. Stewardship for the Earth: We seek to instil in our students, parents, and staff not only a reverence for the earth, its waters, and all living things, but also a sense of stewardship for the environment based on a conviction of our individual responsibility for the beauty of the land and the health of our ecosystems. Global Understanding: All Montessori schools are, to a large degree, international schools. They not only tend to attract a diverse student body representing many ethnic backgrounds, religions, and international backgrounds, but they actively celebrate their diversity.